This Chicken Tikka Masala post has been sponsored by ShopRite Supermarkets. All thoughts and opinions are my own. 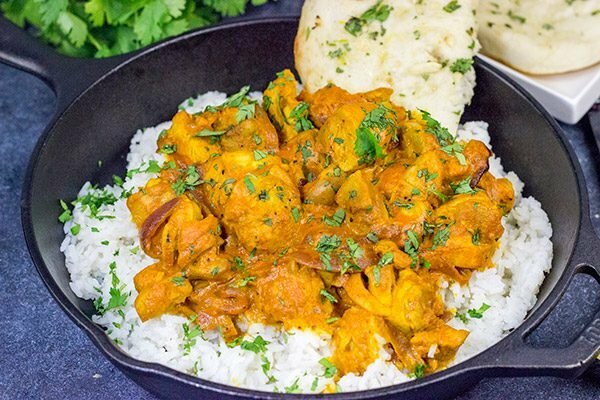 Skip the take-out and make this Chicken Tikka Masala at home! Simmered in a flavorful yogurt marinade, this classic Indian dish is packed with incredible flavor! Every summer, one of my favorite sayings is “it’s time to go mow the weeds”. Well this year, I finally got tired of seeing more weeds than grass, so I convinced Laura to help me reseed a large portion of our backyard. Fast forward a couple of months and it’s safe to say that we bit off a bit more than we could chew on that project. We don’t mind doing DIY projects around the house but reseeding a significant portion of the lawn is a big project! From tilling up the weeds to properly preparing the area with fertilizer and lime, I feel like every weekend lately has been spent working on that patch of yard. And that doesn’t even include the multiple-times-per-day watering. But, darn it, that patch of yard is going to be amazing next spring! One of the ways we convince ourselves to go out and work on the lawn each Saturday morning is the promise of delicious comfort food for dinner later that night. It’s been a hot summer here in upstate New York, and some of those Saturday mornings have been downright exhausting. 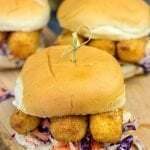 But knowing that you’ve got tasty food on the agenda helps you forget about the hard work! Laura has always loved Indian food. Neither of us grew up eating Indian food, but one of Laura’s roommates in college was Indian. They would make Indian food together quite a bit, and Laura learned all of the tips and tricks to making tasty Indian food. Laura has since shared many of those tips with me, and now I’m sharing one of our favorites here on the blog: Chicken Tikka Masala. Laura calls this Chicken Tikka Masala recipe one of her top 3 recipes of all time. Both of us love to cook, so a spot in the top 3 is impressive! Chicken Tikka Masala starts with chicken marinated in yogurt and spices. (The spice list might look long, but chances are you already have most of them in your spice pantry.) Then that chicken gets simmered in a creamy sauce the next day before being served over rice. And it really is delicious! <– This is coming from someone who didn’t grow up eating Indian food! For me, one of the most important ingredients in this Chicken Tikka Masala is not the chicken or the spices…it’s the naan bread. Seriously! This recipe is saucy, and that naan bread is a requirement for scraping up every last bit of the sauce from your plate. And this sauce is just too good to leave on your plate! As I was leaving the curling club the other day, I stopped into ShopRite Supermarket to get the ingredients for this Chicken Tikka Masala. When I went to get the naan, I noticed ShopRite has a new line of ShopRite Trading Company products. I was intrigued! ShopRite Trading Company is a line of products imported from around the world. For instance, the STC Tandoori Naan as well as the STC Garlic Tandoori Naan are both imported directly from India. How cool is that? The naan is hand stretched before being baked in Tandoor clay ovens. Other imported products in the ShopRite Trading Company line include Kalamata Olives from Greece, STC Smoked Salmon imported from Norway and Extra Virgin Olive Oil imported from Italy. The fact that I can find these specialty ingredients in my local ShopRite Supermarket is especially appealing to me, too! Our closest ShopRite is located right next to the curling club, which is perfect since I’m at the club multiple nights a week. 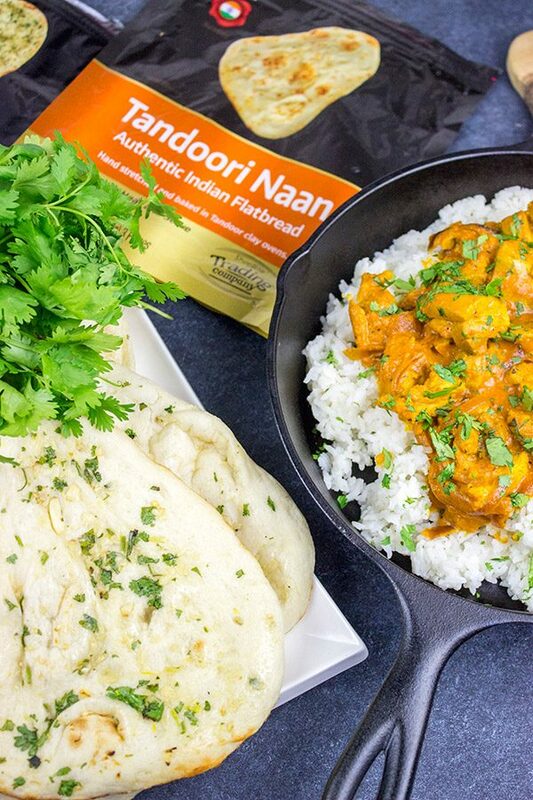 Laura’s already been begging me to make another batch of this Chicken Tikka Masala, so I’ll just have to swing through ShopRite and pick up some more of this Tandoori Naan (it’s in the freezer section). This naan is so tasty that I can totally just eat it by itself. In fact, maybe I’ll buy a couple of packs next time –one for after my curling game and another for Chicken Tikka Masala. 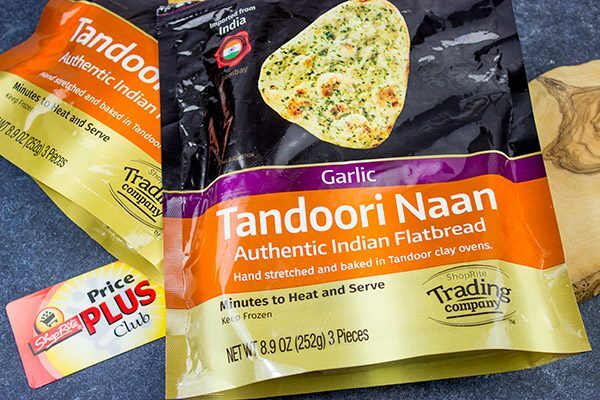 I highly suspect that both the Tandoori Naan and the Garlic Tandoori Naan will be staples in our freezer now! Next time you’re in a ShopRite Supermarket (here’s a link to their store finder), check out their lineup of ShopRite Trading Company products. The fact that these products are imported from around the world is really awesome! 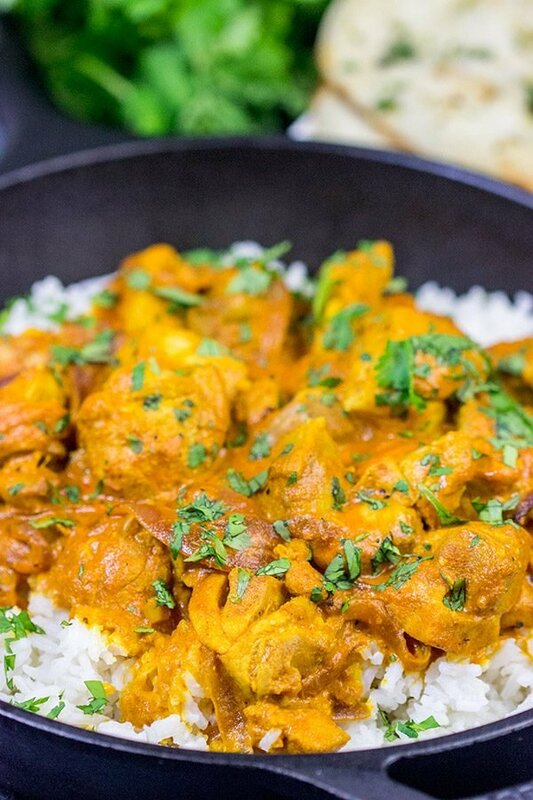 I hope you enjoy this Chicken Tikka Masala as much as we do. And make sure to grab extra Tandoori Naan…you don’t want to leave any of that sauce on your plate! Cheers, friends! Add butter to skillet. Once melted, add sliced onions. Cook, stirring occasionally, for 3-4 minutes. Add garlic and ginger; stir and continue cooking for 1-2 more minutes. 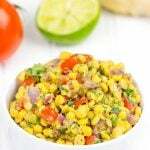 Reduce heat to medium-low and add tomato sauce, cumin, paprika, turmeric, garam masala, coriander, salt, pepper and cayenne; stir until well combined. Simmer for 8-10 minutes, stirring occasionally. Add heavy cream, sugar and chicken; stir until well combined. Continue cooking for 10-12 more minutes, or until chicken is fully cooked. Divide rice onto plates and top with cubed chicken and sauce; garnish with cilantro. 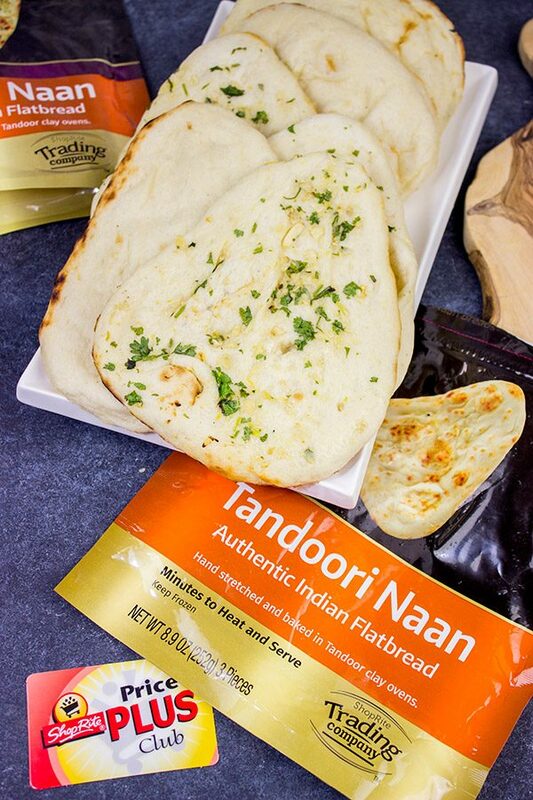 Serve with ShopRite Trading Company naan. I don’t make much Indian food, it’s usually left to restaurant fare. I like the way the mix of this sounds and, given how highly you guys rate it in the rotation, I’d like to give it a try. Thanks! You know, I’m like you, Bill. I’ve dabbled in Indian food, but I didn’t eat it growing up, so I don’t have much experience in that genre. Laura is slowly changing me, though. 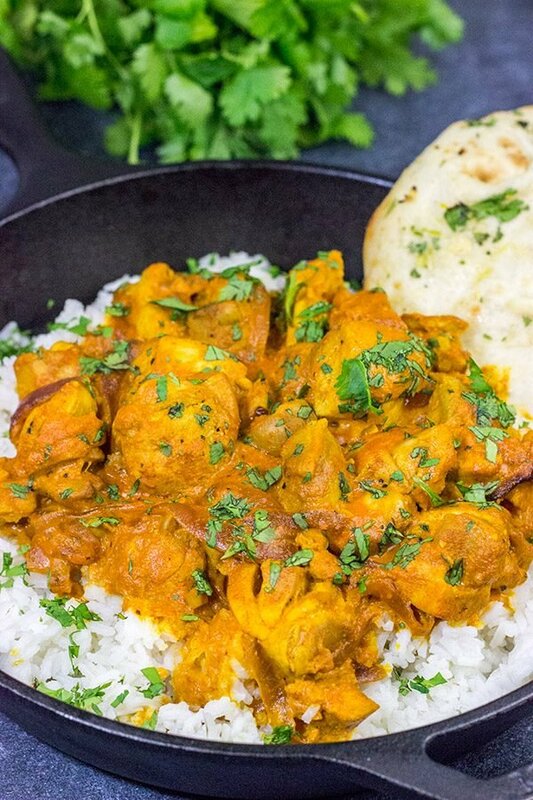 Laura loves Indian food, and she is still raving about this Chicken Tikka Masala. It’s definitely in our regular mix of meals now! Thanks so much, my friend! I LOOOOOVE Indian food! I also didn’t grow up eating it but fell in love when some friends and I were in London forever ago. Nothing compares to those delicious warming spices! As for your yard–I’m highly impressed that you guys took on the job of reseeding your lawn. If you’re interested in doing the same for me I’ll gladly have dessert waiting when you’re done! 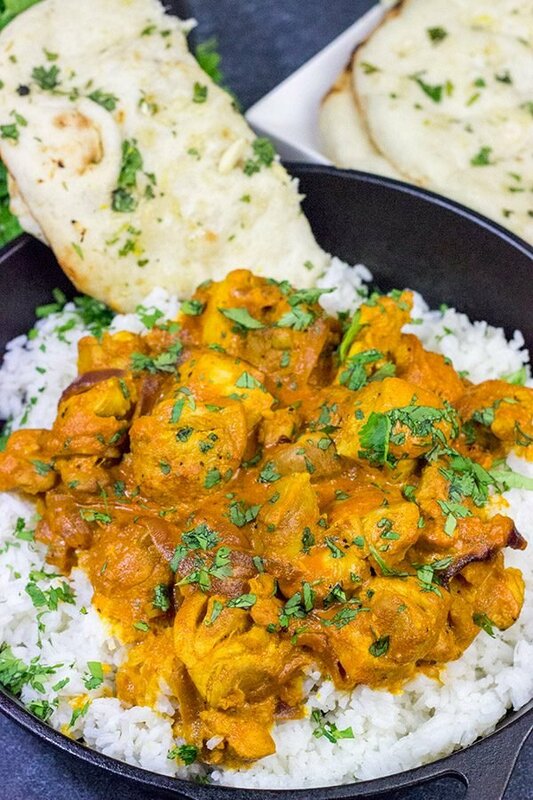 David, Chicken Tikka Masala is one of our favorite takeaway meals. Funny, I’ve never made it, but must now. We get fresh tandoori naan from our takeaway (yes, they have a big tandoor) and I got to tell you that naan you have in your images looks just like what we get. 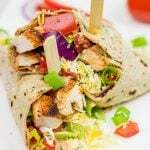 Great post, I’m inspired to give up Chicken Tikka Masala takeaway (at least once). I’m right there with ya, Ron! Chicken Tikka Masala was always something Laura got as take-out. Over time, I nibbled on a bite here and a bite there until I decided I actually liked it. So of course we turned our efforts to learning how to make it here at home. So good! 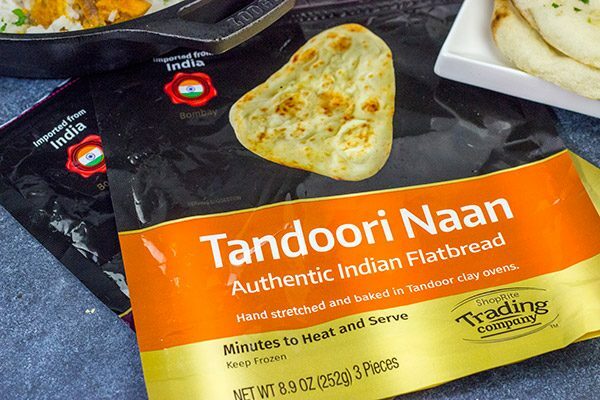 I know you guys don’t have ShopRite over there, but the naan is baked in tandoori in India and then imported here to the States. So it’s the real deal…and I could totally eat it by itself! (Actually, Robbie did polish off one of these by himself. Haha!) Thanks so much, my friend! Hey, we have a LOT of parts of the yard that still need re-seeding. I’ll take you up on that offer! Of course, we have to wait until next year at this point. But come on up and I’ll still make a batch of this Chicken Tikka Masala (with plenty of naan!) for you, Shashi. Cheers, my friend! You made my most favorite Indian dish, I can have it several times a week it’s just one of those dishes that you can never get bored of! I’m pretty sure you just described Laura’s dreamland, Muna! I really enjoy this Chicken Tikka Masala, but Laura goes bonkers over it. She saw it on scroll by on Facebook when I posted this yesterday, and her first words were: “Oh, I want Chicken Tikka Masala now.” 🙂 Thanks so much, my friend! Haha! That’s a deal! Of course, we’re heading into leaf season, so I can use plenty of help. 🙂 But I promise to have plenty of Chicken Tikka Masala for our reward! Our lawn is a constant battle too, David. I feel your pain! Confession: I’ve never made Chicken Tikka Masala at home, but now I’m totally inspired to try. Yours looks as deliciouos as anything I’ve had at a restaurant! You’ve totally got to make Chicken Tikka Masala at home, Marissa! 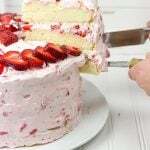 It is absolutely delicious, and it’s so much easier than I realized, too. Put it on the menu! 🙂 Oh, and good luck with the lawn…ugh. Haha. Hope your weekend is going well! 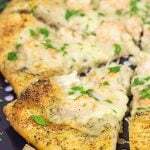 I just love naan bread and I bet I would love it even more with this recipe! Perfect after a day of yard work I am sure and since fall is here I have been doing a lot. And perfect after curling I’m sure. My daughter tried it and loved it. Said it’s a lot more fun than it looks. And A LOT harder! Hey Abbe! I’m right there with ya on the naan bread. 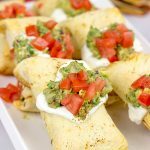 I absolutely love all bread, so of course naan is right up there on my list, too! It’s essential for a good Indian recipe like this Chicken Tikka Masala. And, yes, curling is indeed a lot harder than it looks on tv…but it’s also a really fun sport! Both Laura and I curl a lot, so I’m sure you’ll hear me talking about it more as we head into the winter months here. Haha! Thanks so much, my friend! Indian food is one of my all-time favorites, too! I just love all of the spices. I actually just made my own Garam Masala believe it or not – (they don’t see that at Trader Joe’s) so there you go. 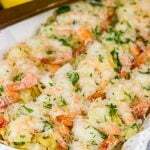 Anyway, thanks, David, for the recipe, pinning so I can make it one day soon! Hey Miriam! Oh geez, your entire lawn was destroyed? Ugh. Although at times I kinda wish our entire lawn was destroyed…it’s all weeds anyways. The areas that we tore up and planted from seed are looking good, but we didn’t do the whole yard. (We had to bring it into more manageable size pieces.) That’s next year’s project! So definitely put this Chicken Tikka Masala on your list of things to make at home. Sure, it’s easier to order it for take-out…but it’s so much better at home! And, yes, that naan bread is a key ingredients here. Yum! I hope you are doing well, my friend! Many years ago I had a friend who kept bugging me to “teach” her to cook Indian food. I kept saying “Just follow a recipe!” But I succumbed and she and I cooked while the guys…. and at the end, after many dishes, she exclaimed, “Cooking Indian isn’t any different than what I do!” They use the same techniques, except for a tandoor! And it’s good to have all of the individual spices on hand, and that’s it. Get a good cookbook and just do it. You’ll love how wonderful all of the different dishes are even if they all look like curries! Madhur Jaffrey is a good solid cookbook author, if you need a suggestion. Hi! I m indian n i m happy that u americans have jumped on the gravy boat. Better late than never! Laura’s a lucky girl the way u keep talking ’bout her. Any chance v can c her? Thanks so much for stopping by and commenting, Faiza! Laura really is a great inspiration when it comes to different flavors (compared to what I grew up with). I occasionally include photos of Robbie and Laura in my posts. Here’s one from last Fall (a year ago): https://spicedblog.com/maple-bacon-chili.html Thanks again, my friend!